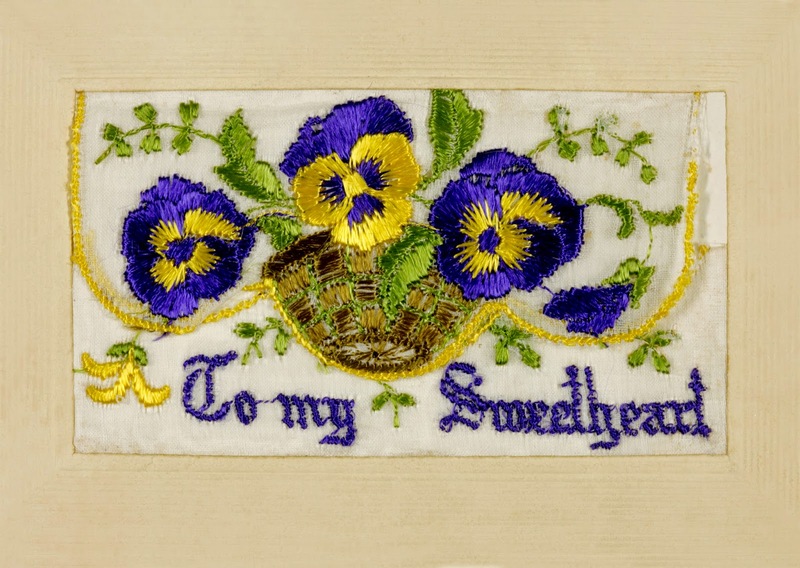 According to author and historian John Laffin, it took between 4-8 hours to embroider each postcard but as demand grew the quality declined. 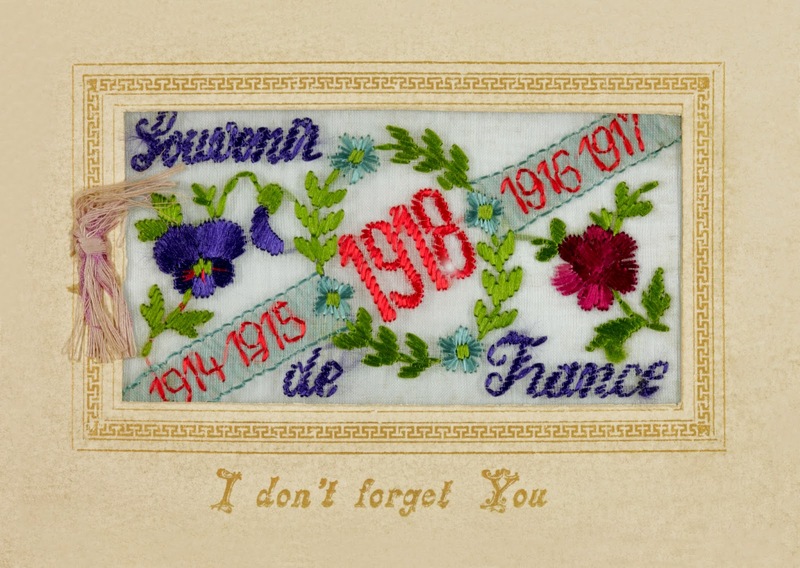 The delicate, tender embroidery contrasted with the gruesome realities of the First World War, giving no indication of what the soldiers were experiencing and sparing families back home from the true horrors of war. Most cards bore a cheerful greeting, tying in with government authorities who suppressed news of the terrible conditions, lost battles and casualties in order to encourage recruitment. Novelty postcards made from card and silk featured in the Paris Exhibition of 1900, but a new market developed during the First World War via nuns in convents around the soon-to-be invaded areas of Belgium and Northern France. 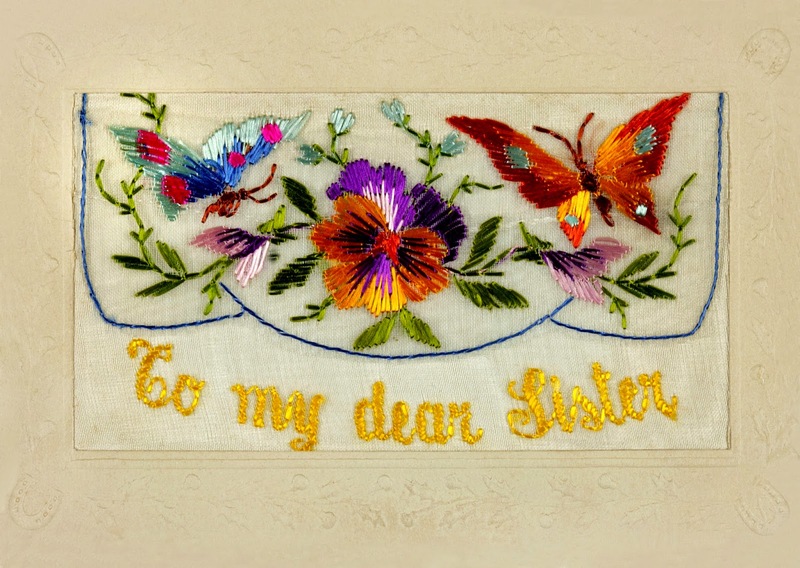 The nuns had long been embroidering church vestments as well as commercial items to support their ministry. 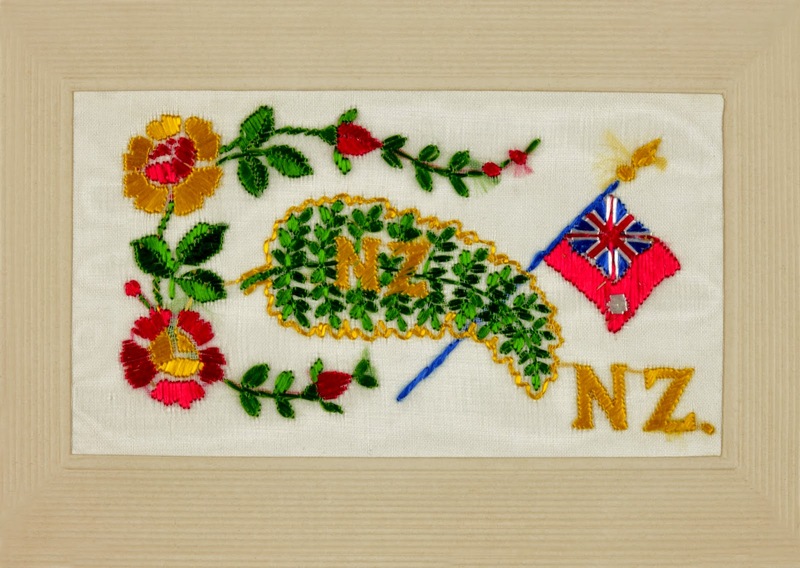 After 1915 they organised refugee women and girls to embroider these complex, war-themed souvenirs in their homes or at refugee camps. Gradually, production was moved to factories and included machine embroidery. Usually 25 identical designs were printed onto rolls of silk/organdie, although some rolls have been discovered with 400. Once embroidered, they were cut and mounted onto card backing and sold in shops across France, through the YMCA’s recreation centres and at training facilities. Today, WWI Silks are often in excellent condition as a waxed envelope was provided with them for mailing, and soldiers would often slip these inside a second envelope for protection. Nor were postage stamps attached as they were sent home through the military mail system. Finally, their recipients took great care to preserve the Silks, saving them in keepsake boxes or framing them to hang above the mantlepiece. 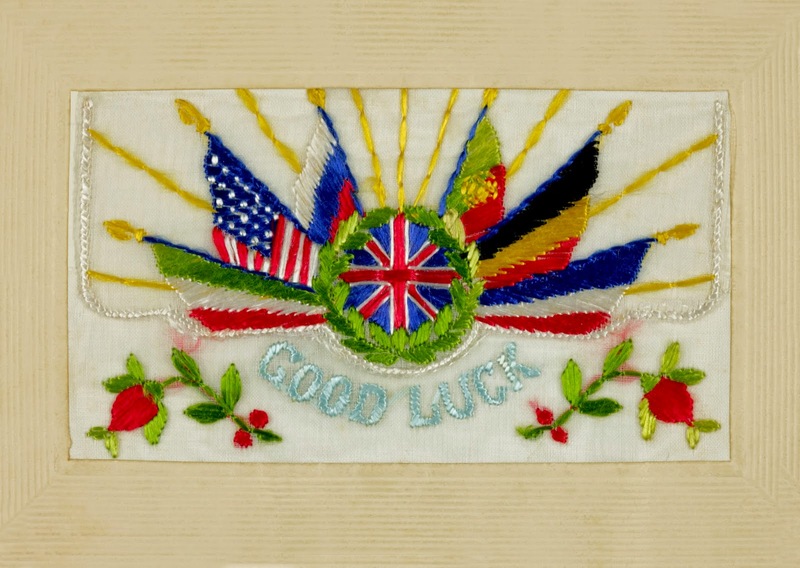 The Silks are popular with collectors of military memorabilia, particularly those featuring regimental badges, or unusual images like bi-planes, or spelling mistakes such as a Christmas card showing an English pudding with mistletoe and the words Tranch Pudding. 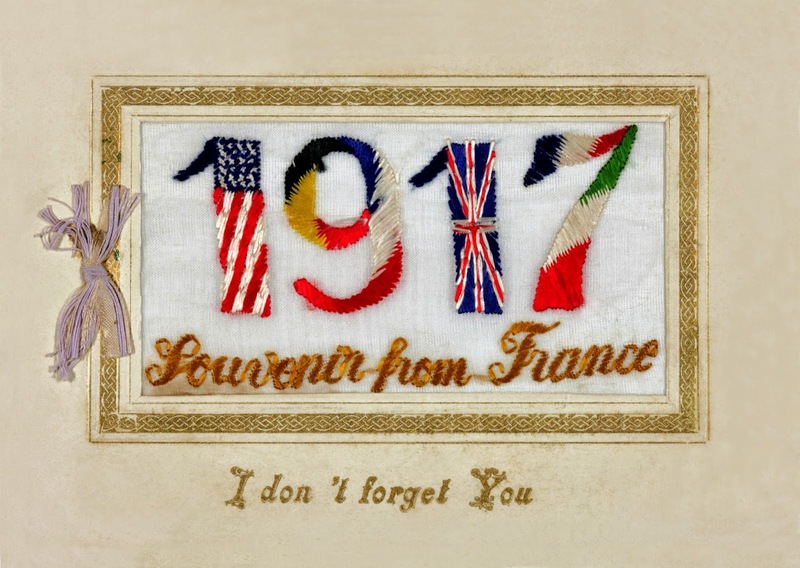 A WWI Silk recently sold for $150 on an online auction site. During the war, the cards cost half a day’s pay for a regular British soldier or two days pay for a French one. You can purchase fascimile/replica greeting cards of the Silks pictured in this post, which are drawn from the Ephemera Collections of the Sir George Grey Special Collections. 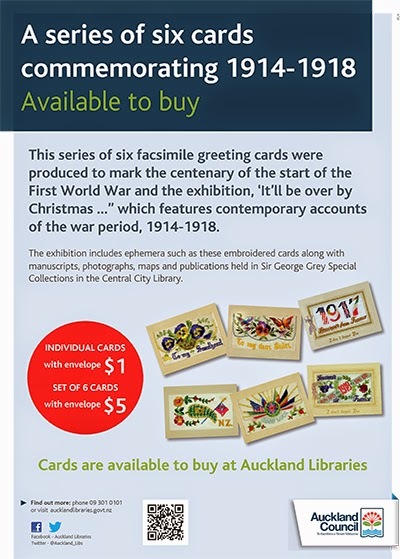 These cards are available from the Sir George Grey Special Collections and at the research centres around the region. See the poster below for more information.